Found her on the 1920 West Allis Ward 1, Milwaukee, Wisconsin census (dist 327 img 44) as Freda A. Hockmuth age 25. Found her on the 1910 Blossburg, Tioga, Pennsylvania census (dist 134 img 27) as Minnie Kellen age 32. Has given birth to 5 children, 4 are living. Found her on the 1920 Milo, Yates, New York census (dist 179 img 7) as Minnie Kellen age 42. Found him on the 1870 Concord, Jackson, Michigan census (img 15) age 10, attending school. Found him on the 1900 Township 139, Stark, North Dakota census (dist 163 img 1) as Bernard Angell age 8. Found her on the 1930 District 5, Knox, Tennessee census (dist 75 img 1) as Ina M. Baily age 1 year 10 months. Found him on the 1930 Gastonia, Gaston, North Carolina census (dist 18 img 18) age 4 years 8 months. Found her on the 1920 Ironton, Lincoln, North Carolina census (dist 105 img 25) age 11. Found her on the 1930 Iron Station, Lincoln, North Carolina census (dist 7 img 1) age 22, single, living at home, teacher, public school. Found her on the 1910 East Greenwich, Gloucester, New Jersey census (dist 119 img 1) as Ida M. Dersch age 5. He was often referred to as Timmy. A Penn Yan motorist was taken to Soldiers and Sailors Memorial Hospital suffering from injuries received in a one-car accident at 11:15 p.m. Friday on Rt. 54A, outside the southern limits of the village. Cole T. Finger, 21, of 336½ E. Elm St., was treated for a fractured leg and abrasions of the face, according to the Yates County Sheriff's Department. Police said that Finger was traveling south when his car failed to make a curve in the highway. This caused the vehicle to strike a utility pole and sideswipe the cement entrance markers at the St. Michaels Cemetery. The car was wrecked. Finger was given a summons for speed not reasonable and prudent. - The Geneva Times March 7, 1970 page 15. Family 1 : Frances E.
Found him on the 1880 Livingston, Columbia, New York census (dist 23 img 13) as Franklin Fingar age 6. Found him on the 1900 Livingston, Columbia, New York census (dist 25 img 7) as Frank Fingar age 21, living at home. Farm labor. Found him on the 1910 Livingston, Columbia, New York census (dist 29 img 30) age 30, living at home. Found him on the 1930 Livingston, Columbia, New York census (dist 37 img 7) as Frank Fingar age 51, farmer, fruit farm. He is living 2 dwellings away from his brother Rossman Fingar. Found him on the 1940 Livingston, Columbia, New York census (dist 11-42 img 3) as Frank Fingar age 62. He is living next to his brother Rossman Fingar age 55. Peter Fingar of North Germantown died at his home Tuesday. He had been in ill health for some time, but his condition was not considered serious until about a week ago. He leaves to survive him his wife, five sons. Warren L. of Amsterdam. Lyle P., Luther B , Elmer L. and Willis E., all of North Gcrmantown, and two daughters, Mrs. Roy D. Snyder of Pittsfleld, Mass, and Miss Aletha M. Fingar of North Germantown. Found him on the 1900 Germantown, Columbia, New York census (dist 13 img 9) age 40, fruit grower. Also living in his household is Gitty E. Cole, age 55, aunt and Andrew Roberts, age 23, border. Found him on the 1910 Germantown, Columbia, New York census (dist 12 img 9) age 50, fruit farmer. Found him on the 1920 Germantown, Columbia, New York census (dist 17 img 3) age 59. Found him on the 1880 Maple Creek, Outagamie, Wisconsin census (dist 122 img 3) age 7. Found him on the 1900 Maple Creek, Outagamie, Wisconsin census (dist 91 img 8) age 28. He is living next door to his mother Mary. Found him on the 1920 Matteson, Waupaca, Wisconsin census (dist 130 img 20) age 47. Found him on the 1930 Matteson, Waupaca, Wisconsin census (dist 26 img 14) age 57, farmer. Found him the 1900 District 10, Blount, Tennessee census (dist 21 img 15) as Buford Finger 19, farm laborer. His wife is a widow on the 1910 census. Found him on the 1920 Rochester Ward 18, Monroe, New York census (Dist 211 img 5) as Earl Finger age 5. Assuming his parents, based on Family Tree entries at ancestry.com, but no documentation. He is listed as James Finger on his son Daniel's death certificate. Found him on the 1850 (not stated), Catawba, North Carolina census (img 59) as Jones Finger age 38, farmer. Found him on the 1860 (not stated), Catawba, North Carolina census (img 166) as Jonas Finger age 50, day laborer. Found him on the 1870 Caldwell, Catawba, North Carolina census (img 6) as Jones Finger age 51, farm laborer. +Kenneth "Kenny" Blair FINGER Jr.
Found him on the 1920 Ironton, Lincoln, North Carolina census (dist 104 img 29) age 1 year 7 months. Found him on the 1930 Ironton, Lincoln, North Carolina census (dist 8 img 2) as Kenneth B. Finger age 11. The wedding of Miss Elisabeth Mildred Finger, daughter of Mrs. Ada Finger of Market street, Saugerties, to the Rev. Jay Elmer Cates, pastor of the Methodist church of Saugerties , took place at 4 o'clock Wednesday afternoon in the church. The Rev. Luther B. Wilson, bishop of the New York area of the Methodist church performed the ceremony, assisted by the Rev. 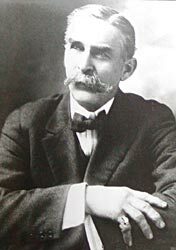 George Benton Smith, district superintendent of the Kingston distrilct. Mrs. Henrietta M. Fellows, an aunt of the bride, played the organ, and Mrs. Dorothy S. Overbaugh sang. Miss Margaret Oakley of New Vork ciry was maid of honor, and the bridesmaids were Miss Kathryn Fellows, a cousin of the bride, and Miss Mercedes Preston, both of Saugerties. Janice Fellows was the flower girl. The bride, who was given in marriage by her uncle, Justin L. Bishop of Coeymans, wore a period gown of White crepe de chine, trimmed with long white fringe. She wore a veil and carried white roses. The maid of honor wore a period dress of white taffeta and a black velvet hat and carried pink roses. Miss Fellows wore a gown of green taffeta with a black velvet hat, and Miss Preston wore golf taffeta with black velvet hat. Both carried pink roses. The flower girl wore pink taffeta and carried a basket of rosebuds. A reception at the home of the bride's mother followed the ceremony. The couple than left, upon a wedding trip. Found her on the 1920 Saugerties, Ulster, New York census age 21. Found her on the 1930 Saugerties, Ulster, New York census as Mildred E. Finger age 31. Found her on the 1940 New York, Bronx, New York census (dist 3-1383A img 25) as Mildred F. Cates age 41. Found her on the 1850 Lehman, Pike, Pennsylvania census (img 10) as Sarah Finger age 20. Found her on the 1870 Middle Smithfield, Monroe, Pennsylvania census (img 12) as Sarah Hannis age 40. There is no husband listed and the word 'widow' is there but has been crossed out. Found him on the 1905 Rochester, Monroe, New York state census (E.D.02 img 24) as William A. Finger age 17. Found him on the 1910 Rochester Ward 19, Monroe, New York census (dist 188 img 23) as William Finger age 22. Laborer, brickyard. He is single and living with his parents. Found him on the 1930 Steubenville, Jefferson, Ohio census (dist 31 img 23) as Charles K. Fingers age 2 years 7 months. Found her on the 1900 Kingston Ward 1, Ulster, New York census (dist 97 img 15) as Lizzie Harris age 18. Found him on the 1900 Cohocton, Steuben, New York census (dist 71 img 30) as Ed Hibbard age 16. He is living with his mother and step-father William Stone. Found her on the 1920 Lincolnton, Lincoln, North Carolina census (dist 108 img 25) as Bettie Honeycutt age 1 year 8 months. Found her on the 1930 Lincolnton, Lincoln, North Carolina census (dist 14 img 4) as Bettie Sue Honeycutt age 11. Found him on the 1880 Campobello, Spartanburg, South Carolina census (dist 139 img 57) as Albert C. Johnson age 4, at school. Found her on the 1870 Clay, Onondaga, New York census (img 74) as Rosa Littleboy age 3. Found her on the 1880 Clay, Onondaga, New York census (dist 166 img 9) as Rosea Littleboy age 13. 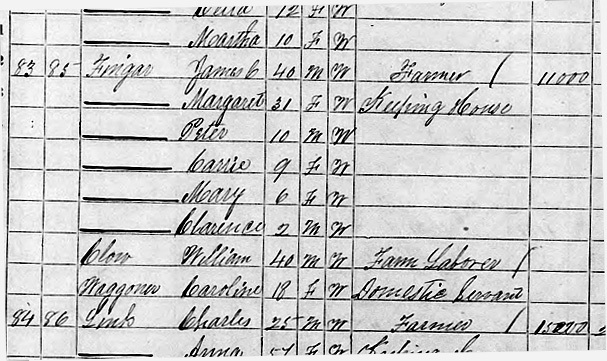 Found her on the 1930 Bath, Steuben, New York census (dist 9 img 7) age 2 yrs 1 month. Found him on the 1900 Greenville, Floyd, Indiana census (dist 56 img 9) as Nicholas Reisert age 66, farmer. His son Peter and wife Anna are living in his household. Found him on the 1910 Greenville, Floyd, Indiana census (dist 63 img 8) as Nicholas Reisert age 73. He and his wife Christina are living with the family of their son Peter. Came to the U.S. in 1846. Father, mother born Germany. Found him on the 1910 Salina, Onondaga, New York census (dist 87 img 36) as Gabriel Schiesser age 47, widower. Farmer. Found him on the 1920 Salina, Onondaga, New York census (img 17) as Gabriel Schiesser age 56, farmer, truck farm. Found him on the 1930 Salina, Onondaga, New York census (dist 182 img 2) as Gabriel Schiesser age 67, gardner, truck garden.